The Small Non-Aggregate Leach Field System with Big Performance! When your installation requires extra capacity in less space, GSF In-Drain from Eljen delivers. 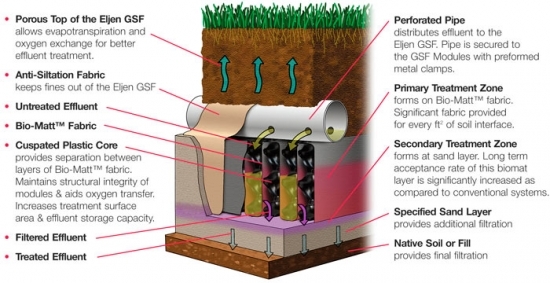 While conventional systems rely on a single biomat forming at the soil interface, GSF In-Drain adds a second, primary biomat layer on the surface of it's unique Bio-Matt™ Fabric. Copyright © 2019 Construction Consultants, Inc. All rights reserved.